David was born in Weyauwega, Wisconsin on June 27, 1933, the youngest son of Walter and Margaret Richter and brother to his older sister, Lugene Richter. As a youth, David was a mischievous youngster and spent the majority of his time with his best friend his sister, Lugene, honoring their parents’ wishes that they remain close. This relationship grew and fostered into adulthood until Lugene’s death in 2009. David lived in several different small towns in central Wisconsin landing in Marshfield Wisconsin. David entered the Navy in 1952 as part of the “Buddy” program only to be separated after boot camp. During the Korean conflict, David was deployed to patrol the Sea of Japan. He was stationed on the aircraft carrier, Tahara. After completing his tour, David returned to Marshfield, Wisconsin, where he met the love of his life for the next 56 years, Marlene Schlinsog. David was 23 when he met Marlene in a tavern. Marlene was 19 years old. She was having pizza with friends and sitting by the jukebox. David asked Marlene to play a song they could dance to. She selected, "See you later, Alligator." David did not see her again, because Marlene's mother did not want her to be a teenage bride, so David waited to marry her on June 15, 1957, a week after her 20th birthday. David and Marlene would have celebrated their 62nd wedding anniversary this year. She was the love of his life and now the jukebox is playing once again—jitterbug away! In Marshfield, Marlene and David loved to spend time with family and to dance, visiting several of the local ballrooms in the area, including the Silverdome. Two years after they married, they gave birth to son Bradley in 1959. After Brad was born, the family moved to Park Falls, Wisconsin, where David worked as an accountant. There, in 1963, they gave birth to son Scott. Eventually, a job offer brought them to Fridley, Minnesota, where David began to work for Schaper Manufacturing, which made the popular Cootie toys. While David worked for Schaper, Marlene cared for Brad and Scott, and she later opened a day care in their home. In 1986, Schaper was purchased and relocated out of state and David found himself unemployed at 53 years old. Dave soon found work with Lund Manufacturing, where he worked for several years until he took an accounting manager position with Designers Guild, an interior design firm in downtown Minneapolis, where he worked until he retired at 62. But David never really retired. He took a part-time job as a custodian for the Fridley School District and spent most of his time at the Senior High School. It is no surprise that he became a pseudo father to thousands of kids prior to his full-time retirement. 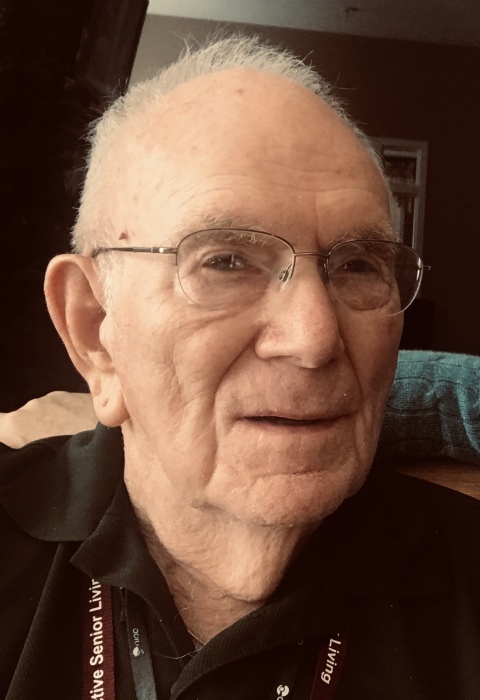 David moved from the family home in 2015 to the Springbrook Apartments, then to the Cherrywood Senior Apartments in Roseville, and finally to New Perspective Senior Living in Columbia Heights where he resided until his death on January 21, 2019. He was a terrific father-in-law to Leslie McAfee Richter and Darcy Richter and uncle to Jeffrey Bores and Michael Hawkins. He was the proud and loving grandfather to the children of Brad and Leslie, Bryce (31) and Linley (29); and to Scott's children, Kelsie (32), Kendra (25), and Zackary (24); great-grandfather to Kelsie's daughters, Olivia (6), and Naomi (4); and family friend Bobbie Johnson. David was an active participant Christmas and Easter traditions with his grandchildren that involved cookie decorating and dying Easter eggs. David also took pride in joy in that he attended virtually every school event of both Brad and Scott, and he continued that support with all of his grandchildren. His love and commitment to his family never faltered. And he was their number one fan! He enjoyed his family and spending time at the cabin in Tony, Wisconsin (which he and Marlene owned with David's sister Lugene, and her husband Donald since 1976). At the cabin, he liked playing games, including marbles (a "Sorry"-type board game played on a board made by Marlene’s father) and cards (particularly cribbage and Schmier; he was patient with Marlene as she learned early (you never bid three on an Ace Jack!). David loved to be on the water whether in a row boat, the pontoon, a speedboat, raft, and yes… a floating duck blind. David never passed on an opportunity to do fix up projects around the cabin under Don’s supervision, or put the steaks on the grill as he enjoyed a gin martini on the rocks with 4, not 3 or 5 olives. David was a friend to everyone. He never judged and always had a smile on his face. David was kind and gentle, and all who know him would say he was the nicest guy you could meet. He, too, was a jokester. What was at David’s core was his dedicated, unconditional love for everyone in his family and all his friends. You knew that no matter what, you could count on Dave to be there. To help with EVERYTHING, but ….spelling! Needless to say, Scrabble was a game he refused to play. David will be remembered as a devoted and compassionate husband, father, father-in-law, grandfather, great grandfather, uncle and outstanding and committed friend. And David will also be remembered for baking his renowned chocolate cookies. But as you attempt his recipe, know that there are no shortcuts--each rolled ball must be exactly the same size and you are not to eat them until they are completely cooled at room temperature only. Bake 9 to 11 minutes at 375 degrees. Cool to room temperature…before eating!